"This is a delightfully sweet story. . .for young children." "The story is cute, and the illustrations are fun. The Web page games and related links make the book come alive and add a whole new level of fun. This book and Web page combination will even appeal to children who don't like broccoli." 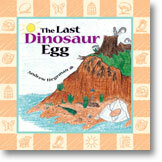 "Just the ticket for young readers who crave a cute dinosaur as pet story. This would also be a fun read-aloud for the K–1 storytime group."